Growing up in Central Pennsylvania, Jason got his start in the roofing industry working for one of the top roofing & construction companies in South Central Pennsylvania. In 2013, he brought his roofing expertise to AROCON as a Roof Technician, because he was drawn to the company's dynamic work environment. It's like a family. Not long after coming on board, Jason was promoted to Field Supervisor. Since starting with AROCON, Jason has shown his amazing customer service abilities with 700+ five-star reviews from satisfied customers. He enjoys working with AROCON installers, and making sure each customer is satisfied with their project and experience with AROCON. He is an expert at diagnosing roofing issues and designing solutions for those issues with a high focus on customer service. Jason currently lives in Carroll County, and when he isn't busy delighting customers, he spends his time with his wife and two kids, reading, and spending time outdoors fishing and hunting. These guys were great! They replaced our entire roof and hauled off all debris and completed the whole thing in a day! We have had neighbors with similar sized houses using other companies take two and even three days for the same job. One neighbor had a roofer's dumpster in his driveway for a week! Not so with these guys, they hauled off all trash and used a magnet to clean up that same day. Aside from the obvious new roof, you couldn't tell that they had been there at all. 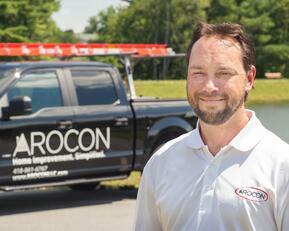 I would highly recommend Jason Easton and Arocon to anyone thinking of getting a new roof. Jason Easton was extremely professional and did a great job managing our roof replacement from start to finish. He was always available to answer any questions or concerns we had. Jason definitely makes the entire process a lot easier than we would have thought. Would highly recommend Jason as well as the company. Great experience with Jason @ AROCON, he was courteous, knowledgeable, and most importantly completed the job in the time frame required. Jason is now my roof guy, period. AROCON tarping! The picture shows how we tarp to protect the exterior of the home. We take pride in making sure that all homes are fully protected when installing your brand new roof.